00:30 I decided to do Factions and Zones in the same contrib. 01:45 chasonchaffin hello! I just started messing around with Evennia at the request of a friend who wants some help coding their game. I've been messing around with the custom gametime and I had a question: is it possible to fast forward, rewind, or pause the game time? 02:12 it's not like a game time system is that difficult to code wholesale either. 03:50 evdemo [Public] bobbob just connected to the Evennia demo for the first time! 03:50 [Public] bobbob disconnected from the Evennia demo. 03:53 DiscordBot <Trayes> Anyone around that can answer questions? 03:53 <Reilena> depends on the question! 03:54 DiscordBot <Trayes> So I am building a mech game and I have people enter mechs to pilot them. The problem is that if I try to target someone or look around, I cant find them. The reason why is that I am INSIDE the mech. Is there a way to make it so that the commands while inside the mech work as if they were outside the mech? 03:55 <Reilena> You'll probably want them puppeting a mech object rather than moving inside of one. 03:55 <Trayes> things do work while they puppet, but is that the best way to go about that? 03:57 DiscordBot <Trayes> Ohh I like that for thematic reasons. 03:58 DiscordBot <Trayes> Nope. Players move in and out of mechs. 03:59 <Trayes> I would go into it more here but I dont want to spam. 03:59 <Reilena> 'vehicles' are fun. 06:14 evdemo [Public] Awdasea just connected to the Evennia demo for the first time! 06:15 [Public] Awdasea disconnected from the Evennia demo. 06:20 chasonchaffin Volund: Thanks for replying earlier, I was away from my computer so I couldn't respond. 06:24 I had another question. as a working python developer I found the installation instructions a little strange (grabbing evennia via github and installing from a local copy). Is there a reason it is recommended to install that way? 08:05 Griatch chasonchaffin: The main reason is that Evennia's source itself is meant to be read and understood (with a very number of comments), so having the code easily available is useful and recommended. That said, we'll eventually make a pip package as well. 08:44 Griatch Cool :) I recently had a talk at a PyCon and talked about Evennia; I was surprised at how positive the reception was; a LOT of people have very fond memories of MU*s even though most don't know they still exist. 08:45 I even met a random other person who was indedependently working on a mud client. 08:46 chasonchaffin: You were helping a friend code a game you said? What style of game are you making? 08:53 Griatch I see. Well, if you are a Python dev you should hopefully be able to find your way around relatively easily. Just ask (here or in the forum) if you have any questions or if stuff appears weird. 08:58 Griatch Thanks, spent a lot of effort on docs. There'll always be places that could be better, but it's an ongoing effort. 09:03 Griatch Ah, the age-long question. https://github.com/evennia/evennia/wiki/Soft-Code is Evennia's official policy on this. 09:55 evdemo [Public] hungi just connected to the Evennia demo for the first time! 09:58 [Public] hungi disconnected from the Evennia demo. 11:50 [Public] idius disconnected from the Evennia demo. 12:40 hey Griatch :D I'm still at it! 13:08 DiscordBot <Chason> I'm here but on Discord now! 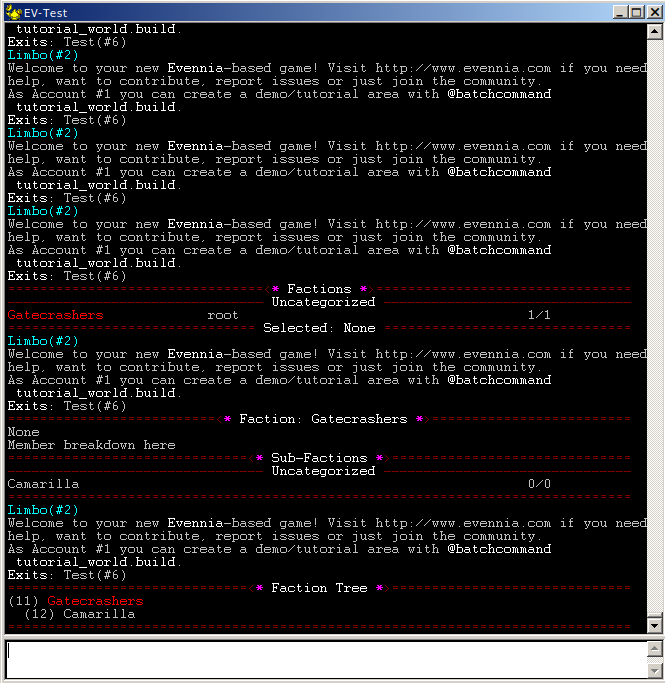 13:08 Volund so, the Faction Script (data storage and API) is about 80% complete and looking spiffy. I'm working on the commands right now so I can properly test said API. 13:11 Factions are collections of Characters. it doesn't matter if they're Mobiles or PCs. Factions have two forms of membership - basic, and main. Main members have ranks and titles. Ranks 1-4 are system provided and can only be changed in limited ways, but the leader (rank 1) is able to create new ranks and even permissions and assign them as they please. 13:11 all members of sub-factions no matter how deep are considered 'basic' members of parent factions up the chain. 13:12 at the same time, anyone who is rank 1-2 (I may change this to some specific permission) is considered Rank 0 of a subfaction - they supersede the sub-faction leader. 13:15 Griatch Do you have to be based off the Character base typeclass or could any Object be used in principle ? 13:20 no actual checks are made at the moment on the API side but I was going to make sure that the commands to put things in them can only target characters. 13:26 I stripped the Faction system down slightly from the MUSHcode version, but on the other hand the MUSHcode version doesn't have the tree structure subfactions thing going on. 13:32 a builder can @zone/select <zone>, and then any rooms and exits they create using @dig and similar tools will be automatically added to the selected zone. 13:34 Chason: So MUShcode background huh? 13:50 I'm pondering what else to add as a Contrib. I know I'm going to make an FCList/Theme system. Also need some kind of 'character approval' tracker. 13:52 Volund a lot of MUSH games allow you to create characters and then 'walk through chargen' after which an admin will review the character and give it their seal of approval for play. unapproved characters frequently cannot enter the game grid or use most of a game's channels; they're little better than Guests. 13:56 That's not hard to code at all. 14:00 DiscordBot <Chason> is it generally preferable for extensions to be written to go into the contribs directory or installable as pip packages? 14:01 Griatch is very big on wanting people to make contribs. but the pip approach does work if you know what you're doing. 14:03 it has 5 seasons - one for each of the elements, Wood, Earth, Air, Fire, and Water. 14:03 each season is split into three months, Ascending, Resplendent, and Descending. 14:03 Volund each month has 28 days in it. 14:03 Volund EACH DAY has 25 hours in it, for 2nd edition. 24 in 3rd edition. 14:04 ... there's a tiny little period called Calibration, a 5 day long period where the night sky has no moon or stars, that does not belong to any specific month and is not technically 'part of the year' at all. it is the time in-between years. 14:05 DiscordBot <Chason> Yeah the int'l fixed calendar has a similar thing, its 13 months of 28 days each. That covers 364 days a year but then the last day of the year is "Year Day"
14:07 I did it through division math largely. the number of seconds, divided up, can tell you which day it is, and the days always progress in the same order. 14:08 Volund NOBODY EXPECTS CALIBRATION. I've yet to see a single programmed fictional calendar that is ready to deal with Calibration. 14:20 also woooooooo. getting these commands working. 14:24 Griatch Chason: actually, what is in the custom_gametime library used to be in core Evennia. It was even configured in settings. We moved it into a contrib because this is such a game-custom thing and you are never going to account for every possible weird calendar out there. 14:25 So today core evennia has the base game time (which is just the normal calendar) and the weird fantasy/sci-fi calendars are to be handled by the contrib on demand. 14:31 should faction leaders be allowed to create their own sub-factions or should they need an admin to do this for them? 14:32 Griatch Does it have to be hard-coded? 14:32 Is it not just a permission you can tweak? 14:32 Volund I'm pondering ways to do it. 14:34 Griatch So you are concerned by sane defaults then? 14:41 Griatch As long as it carefully fails on multi-matches I guess that's fine. 14:43 on the other hand, it supports matching against a list of OBJECTS instead of just strings. 14:43 Griatch By the way - don't embed too much stuff in one PR. Things like the @perm change could be its own PR; it has nothing to do with factions per se. 14:45 Griatch Anyway, never just pick the first match, that's a dangerous move, particularly when you are dealing with permissions. 14:46 No point in making a parallel one that does pretty much the same thing. 14:47 Griatch Evennia as a whole also never just picks-first in a multimatch but always warns. I think that's a sane default. 14:49 Volund I think I'm going to restrict it so that only admin can create Factions for the moment. for my simple implementation. it's just a command though - the API allows anything to happen as long as you can touch it. 14:53 Griatch Chason: The absolute time is the 'actual' time. Relative gametime is the time since the game started and absolute is the epoch + time passed since game started. 14:54 Griatch But you could say that the day you open your game is "day 0" and set your epoch to that. 14:56 Griatch So CmdBase will be used for all faction-related commands I take it? 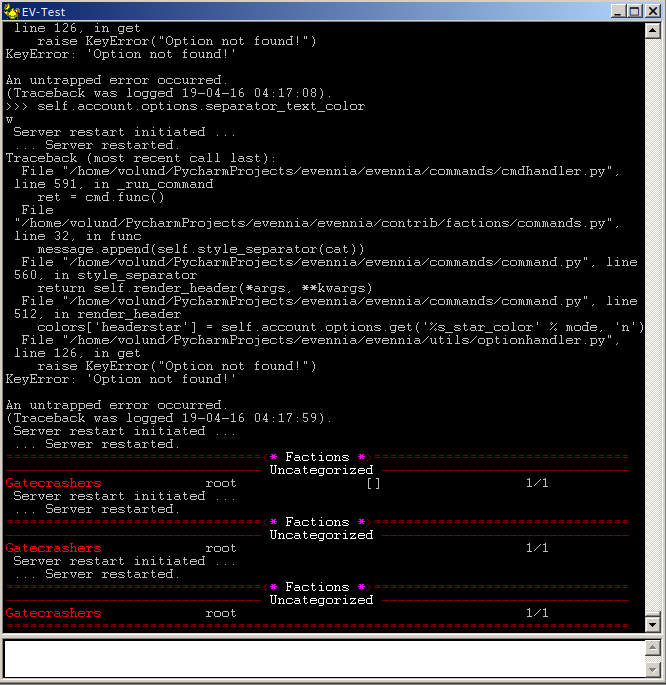 14:58 Volund and then I use Exceptions for all of my error messages so the command aborts right then and there. once ALL checks have passed it does what it needs to do. 14:58 evdemo [Public] flip just connected to the Evennia demo for the first time! 15:02 evdemo [Public] toast just connected to the Evennia demo for the first time! 15:11 Griatch: I ponder the value or sanity of creating a contrib version of BBS that doesn't use models. It would be slightly simplified from what I run in MUSHcode due to not using SQL, and I question how well it would handle running for years straight... but it's actually doable. 15:12 Griatch Or explore how to add optional models at unit-test time. 15:14 Volund this is a problem, what if your system depends on having global scripts running or alterations to settings.py ? 15:15 Griatch Yep, one needs to handle that in the test. 15:15 Griatch One can mock things. 15:16 Griatch That is, instead of you actually setting things up, you use the mock library to inject a dummy thing at the point your code wants it. 15:16 We use mocks extensively in the test suite. 15:17 django even has its own decorator for it. 15:19 At any rate, I spent most of last month writing unit tests to increase coverage on py3; this is important stuff. 15:19 Griatch I should really start demanding unit tests on all contribs, but so far it's only required for contribs since they are particularly vulnerable to regressions when the server code changes. 15:21 Griatch Volund: Making unit tests is not particularly fun, no. It's tempting to just put something together and go with it. But it does help a lot with stability. 15:23 I found that for some things it was also very useful to make unit tests just to have as quick testers/debuggers while developing. For example, when developing the new prototype extensions, I made a test suite that I just ran until I found no more errors. Much faster than to log into the game, reload and enter a command. 15:24 Griatch And then you just let those unit tests stay so that you know functionality remains unchanged later. 15:26 Volund Griatch: so what's your view on Contribs that depend on other contribs? like for Factions and Zones, I created what's effectively an abstract class 'Tree Script.' It supports all of the hierarchy/children/parents stuff, name sanitization, creating and relocating Tree Scripts within their manager, and so on. Factions and Zones both use it as a parent (though Faction builds on it CONSIDERABLY more than Zones do). 15:27 Griatch If they are multiple files depending on each other, it may be best to group them together in one folder. Not sure there is a common theme for factions and zones though. 15:29 Griatch They do depend on the same parent though, which means a third file that is not itself a contrib. 15:32 evdemo [Public] flip disconnected from the Evennia demo. 15:34 [Public] toast disconnected from the Evennia demo. 15:35 people to get things done. 15:35 DiscordBot <Trayes> Hey everyone. I have a question about being inside an object. Lets say I am inside my mech. Someone outside the mech says HEY. Can I hare them in the mech? If not, how do I make it so that I can hear things intise the mech? 15:38 Griatch Volund: Well, you have worked on various incarnations of Athanor for four(?) years, mostly starting from scratch every six months. Is it too bad to make proper unit tests and actually lock in things you can use? 15:39 ... after trying everything that doesn't a hundred times. 15:39 Though what was that saying? genius is ninety-nine percent perspiration and one percent inspiration? 15:40 Griatch I think the global scripts and option system works well. But it does take a few rounds of revisions and polishing, that's just the nature of things. 15:40 only then will you know how to build something that will work right. 15:45 The @option command could now in principle be made to use the new Option classes (since Options can be stored on whatever you specify). 15:46 Griatch It allows you to override what your client tells you it supports for cases when clients don't TTYPE correctly. 15:47 Volund and there's nobody around to maintain them. 15:48 rnmissionrun_ Is there not going to be a 'clean' branch Evennia without all this added stuff? 15:48 Volund rnmissionrun_: errr, what do you mean 'clean'? 15:49 Griatch rnmissionrun_: What added stuff? The only things in core at this point is a handler for global scripts and a way to store Options in a generalized way. 15:50 so now every evennia command that returns a table does so in color. which is a good thing! in theory. 15:53 You could just set empty strings to these base style options to get no colors at all. 15:58 I dunno, this is how it currently works. 16:00 Griatch Yes? It does not set a default no-color if you don't specify something in your settings? 16:02 if it were 0 characters long, then the replace operation would end up with |<color><thing> being just |<thing> so it would treat characters from <thing> as part of the color code. 16:05 Griatch Right. The styler should catch this case. 16:05 DiscordBot <Kaleara> if there's a contrib that i think doesn't work anymore, should i bug it? 16:09 Volund if I want @charcreate to be admin-only I currently have to either override it with a new @charcreate that has different locks or remove it from a cmdset outright. And there are a lot of commands that one might want to keep around but change their permission levels. 16:11 I'm still pondering the best way to go about stuff. 16:12 Volund then you have to import it and add it and... yeah it's trivial I just always am wondering if there isn't some better way but I don't think there is. 16:12 rnmissionrun I was under the impression that all the stuff Volund was working on, was going to be in the form of contribs that we could use or not, as we saw fit. 16:13 rnmissionrun: yes and no. I am trying to add things to Evennia for more infrastructure which will NOT get in your way, such as Signals. I am also working on contribs. you fell afoul of a WIP in the develop branch that's still being refined. 16:27 rnmissionrun I dunno why you didn't just fork it and do your own thing so that plain Evennia could still be an option for those of us that prefer it. 16:31 Griatch rnmissionrun: There will always be new things in core from time to time; this is no different from me adding prototypes; you can remove and ignore this like other things. 16:46 [Andrew Bastien]: Added at_object_creation_copy hook to DefaultObject. 16:46 [Andrew Bastien]: Refactored the copy hook and added Kwargs. 17:20 Volund they do need to know who made them to really have meaning though. 17:23 There is currently no way to wipe your customization to go back to the default. Just setting your option to the default won't do - then changing settings still won't affect you. 17:26 rnmissionrun Needs more context, what is 'power'? 17:26 DiscordBot <Trayes> The tutorial has you make 2 stats. 17:28 rnmissionrun Where does the variable 'power' get defined? 17:29 DiscordBot <Trayes> rnmissionrun: Thats the part I dont know myself. I dont know what it means to be defined. This is the tutorial. Should be a quick look to see if they did define it. 17:31 Maybe you left out that line? 17:31 DiscordBot <Trayes> I will keep looking. 17:36 DiscordBot <Trayes> Everything you say, I just copy and past into a Notepad so I can try to understand it as I get better. 17:37 DiscordBot <Trayes> another thing I want to do with that system is add STATIC inside of Say messages. For thematic reasons. But that is very low priority right now. 17:38 DiscordBot <Trayes> Cool. Thanks again for all the help. 17:41 evdemo [Public] aaron just connected to the Evennia demo for the first time! 17:43 evdemo [Public] noctis just connected to the Evennia demo for the first time! 17:44 [Public] randomrandom just connected to the Evennia demo for the first time! 17:46 [Public] randomrandom disconnected from the Evennia demo. 17:47 [Public] aaron disconnected from the Evennia demo. 17:48 Volund I wonder if it's possible to inherit from ContentsHandler and rewire it to support concepts like weight and volume. 17:57 isn't this basically what the @property decorator does? 18:05 slackfriarzen <friarzen> wow, lots of people logging into the Evennia demo today. 18:06 evdemo [Public] Alexia just connected to the Evennia demo! 18:07 <friarzen> you can use 'pub some-message-here' to chat with us. 18:07 evdemo [Public] Alexia disconnected from the Evennia demo. 18:27 evdemo [Public] dorkguy just connected to the Evennia demo for the first time! 18:28 [Public] dorkguy disconnected from the Evennia demo. 18:41 DiscordBot <Trayes> Some of these tutorials have not been stupid checked. 18:42 Volund do you see the method called at_cmdset_creation ? 18:43 <Trayes> That is where I had it, and its not showing up. 18:44 <Trayes> So maybe I am doing the import wrong. 18:44 Volund what is your import line? 18:47 so it's from commands import command ? 18:49 <Trayes> This is what I get for typing all the code out instead of copy and paste. 18:49 Volund yeah that would definitely do it. 18:49 systematic approach to debugging really does help. sounds like you're a bit new to Python? 18:50 DiscordBot <Trayes> New to programming in general. My ENG always built me tools in unity to build our games. This is my first solo project. So I am making tons of noob mistakes. 18:52 DiscordBot <Trayes> I have noticed. 20:47 keira_luna hi, trying out building a mud on my local machine for fun using evennia -- annd I forgot my password. Is there a way to reset it or... ? 20:50 chainsol hmm, you could do it, yeah! 20:51 ooh, or just use evennia shell, one moment! 20:52 keira_luna nice!! thank you!! 21:15 evdemo [Public] thorbus1 just connected to the Evennia demo for the first time! 21:16 [Public] thorbus1 disconnected from the Evennia demo. 21:32 evdemo [Public] noldorf just connected to the Evennia demo for the first time! 21:33 evdemo [Public] noldorf disconnected from the Evennia demo. 21:38 Griatch My guess is that these are people who don't know how a mud works at all - they see a link to 'play online' and is lost when they only see text. 21:42 slackfriarzen <friarzen> Are they mostly all connecting using the web client then? 21:44 Griatch I suspect so, if they come via a telnet client they are supposedly skilled enough to at least check out what is available. 21:44 The alternative is of course that they really, really don't like what they see. But not sure how much of an impression you can make in just a few seconds. 21:49 rnmissionrun I've said before that there is nothing on that test site to grab anyone's attention. 21:50 Griatch They do log in though, they should at least be able to read the first introduction and be told that there is a tutorial to play? 22:05 Griatch There are things to do, but if you can't read the intro I guess you are not really trying either. 22:07 castlelore not that it's a bad thing! 22:09 rnmissionrun Would be nice to have a brief survey people could fill out, with questions like "how did you first hear about Evennia"
22:12 Griatch Volund: Replacing the ContentsHandler on your custom typeclass is an interesting solution. 22:26 slackfriarzen <friarzen> I found the vines puzzle to be very very easy compared to getting the darn stick to light. I think my first time through, the first 3 tries all randomly rolled the same "it didn't work" result, so I was pretty convinced I had to do something else first, before I got eaten by a Grue. 22:27 chainsol The vines puzzle really confused me, heheh. 22:28 slackfriarzen <friarzen> Then one of my random flailing attempts to create wood sticks confused the parser and it mentioned "did you mean 'light'?" and so I tried one last time and it worked. 23:27 evdemo [Public] donkey123 just connected to the Evennia demo for the first time! 23:31 [Public] donkey123 disconnected from the Evennia demo.